The Taylormade M3 Is As Long And Straight As Any Club On The Market- You can’t go wrong with this one. Long and Forgiving. Distance: The M3 is flat out hotter than my current driver. I could feel the ball springing off the face. The ball carries forever when you catch it and with less effort, it seems. I really liked the feel and the sound of the ball coming off the face. It felt a lot more lively than my driver and had a pleasant hollow sound when hit solidly. I think it’s basically the same sound most of the newer drivers make and I like it. The club just felt more powerful than mine. Shaping: My standard tee shot these days is a little fade and I hit quite a few long fades down the middle during my last round. The draw used to be my standard shot with my irons and my driver and I never really had to try to hit it. Now it’s not quite as natural off the tee so I don’t worry about it. I go with my prevailing shot shape. Forgiveness: With my better or average swings, I found myself in the fairway or just in the right rough. Truly bad swings just couldn’t be helped and were lost well right. Looks: Gray on black is not my favorite, but it isn’t ugly by any stretch. I strongly prefer the white-on-black of the M1 and M2. Just a personal preference thing. The M3 driver will help you hit the ball straighter, longer, and with less effort. Period. Driving better just makes the game more fun and your golf life easier. 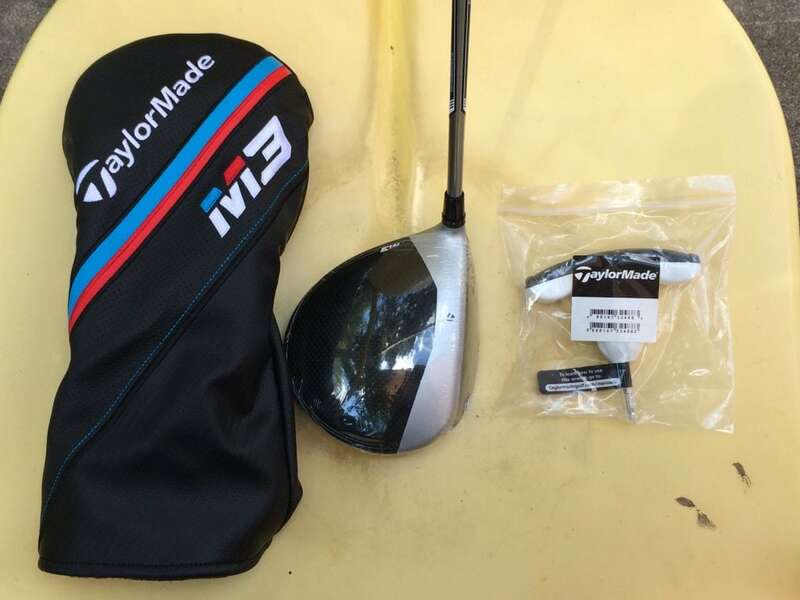 So, I would say you should strongly consider trying out the new M3 from Taylormade. It’s got all the latest cutting-edge technology from a company known to produce great drivers and woods. There’s a host of shaft options and adjustments you can make to dial in your game. Fill out form and pay your $25 trial fee. **NOTE: You CAN BUY using the link below also. 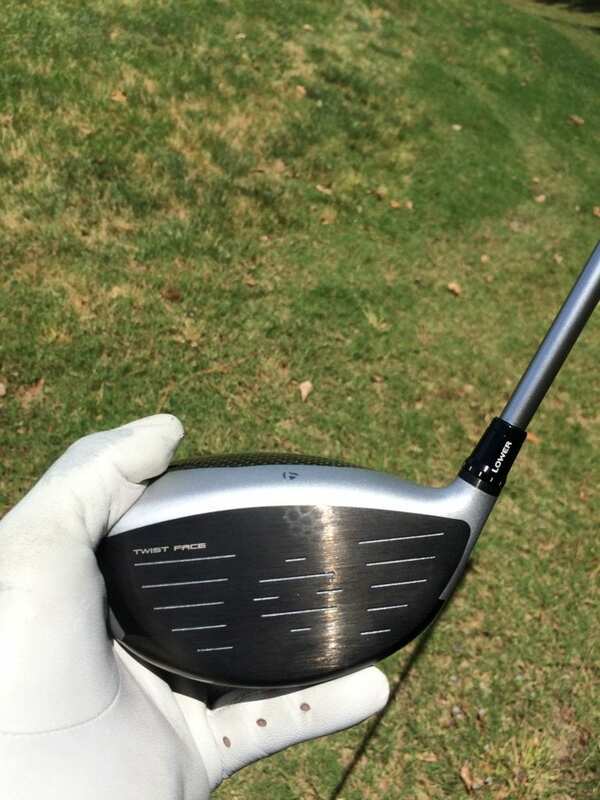 In preparation for testing and reviewing this club, I read a Bunch of reviews from people who actually bought the M3 and were moved to leave a review wherever they bought it. I already know Taylormade produces great drivers and woods, but it was encouraging to read all the very positive reviews. My results weren’t quite as dramatic as what I was reading. I go at the ball too hard with my driver swing, so it can be pretty bad when I’m off. This is something to keep in mind as I give my personal experience with the M3. This driver will not save you from your worst swings, nor will any other driver. If you make reasonable swings at the ball you’ll be able to find it and go for the green. The Twist Face technology does make the driver more forgiving, but really only shines with marginal misses on the heel and toe. My miss is towards the heel, and when I miss, I miss for real. I didn’t really find my stride with the M3 until my last round with it, but once I did, I really enjoyed hitting it. Luckily for us, there’s more going on with the M3 than just the twist face. The face is hotter and produces less spin on shots hit lower on the face. I’m currently an 11 handicap and frankly, driving is a major weakness of mine. I probably get at least 2 penalties off the tee box and another 3 or 4 instances of just getting back to the fairway from errant drives per round. It’s incredibly frustrating and demoralizing, especially since I used to have a decent driver game. I’m now taking lessons because I have no idea how to fix what I’m doing in my swing. I can’t do it on my own, I’ve tried. A third thing I’ll be doing is playing a lot more golf. All the range time I’m putting in is not translating to better scores when I do make it out to the course. I should be the ideal candidate to benefit from this club. Basically, the whole face is supposed to be a sweet spot (more or less) and it is easily adjustable to pretty much any trajectory or shot shape you desire. 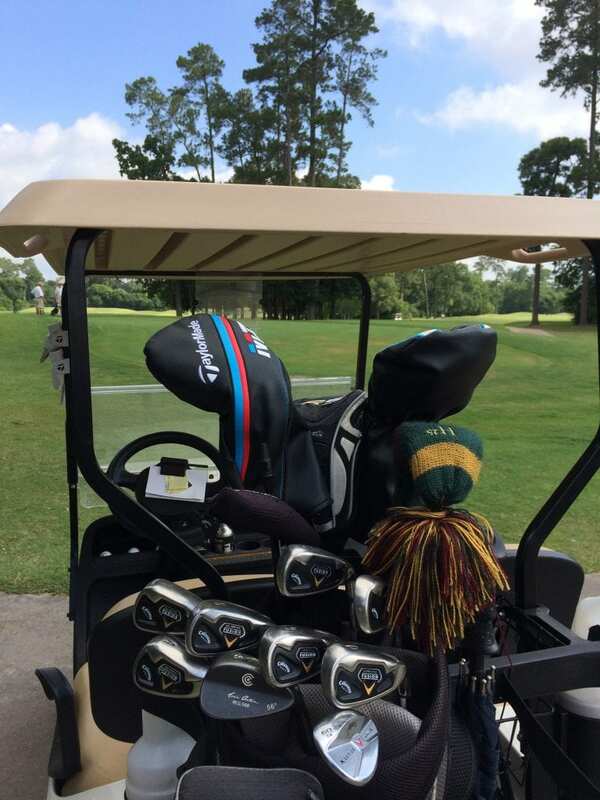 I had the Taylormade M3 for 14 days. I tested it on the range 4 times and played 2 rounds of golf with it. The range sessions usually consisted of a short warm up with a wedge and 8 iron and then diving into hitting drivers. In each session, I would hit 5 drives with my driver and then 5 drives with the M3 and 5 drives with another driver I was testing. I did this back and forth along with mixing in short iron shots when I felt my swing was getting hurried or out of sync. I went through 100 to 150 balls per session. You just need the torque wrench included with the driver to loosen the screw in the heel of the driver. Once that is done, follow the chart and rotate the shaft and Loft Sleeve to achieve your desired adjustment and tighten the screw until you hear the “click” from the torque wrench. 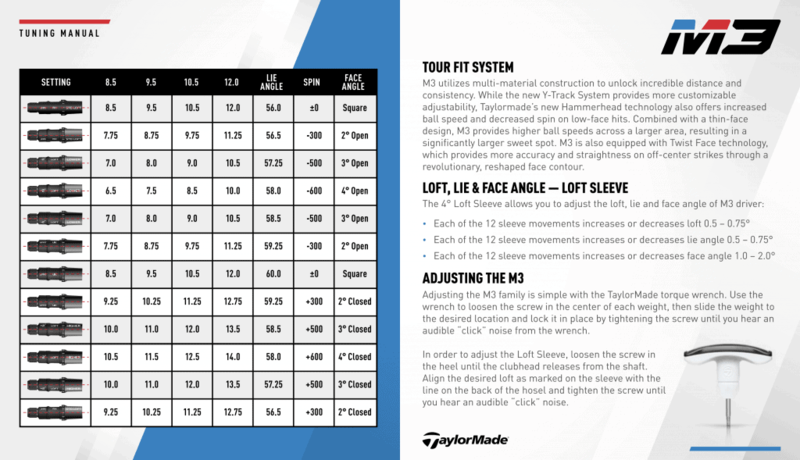 Taylormade provides a handy and easy to understand adjustment guide to help you along. This is a highly personal and individual thing, so experiment on your own or get fitted for this. My personal preference is to have more of a neutral setup with face angle and play with the adjustable weighting most drivers have. In my mind, this gives me the ability to hit draws and fades (though it is more of a grab bag for me right now) more easily. During testing, I ended up on the max forgiveness and max loft setting with the y-track weights for my best results. Why Twist Face Technology: Taylormade found, through extensive testing, that the standard “bulge and roll” used for driver face design since forever didn’t quite have the desired corrective effects on humans as it did on Iron Byron. What the “bulge and roll” is supposed to accomplish is to take drives hit on the heel and gently fade them back to the fairway. Conversely, drives that are struck on the toe of the driver are supposed to be gently drawn back to the fairway, or whatever the intended target was/is. (10 times out of 10, this should be the fairway). Actual human testing showed that drives struck on the heel usually sends the shot well right of the target line and drives struck on the toe usually end up sending the drive hooking well left of the target line. 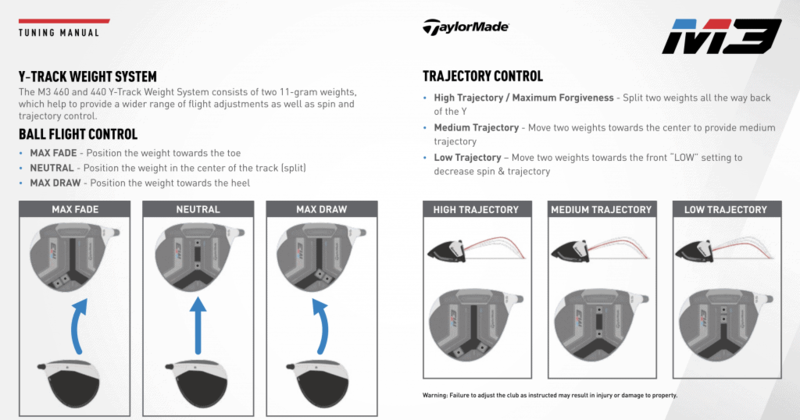 How Taylormade’s Twist Face Technology helps: The toe portion of the face has been twisted open and loft has been added to combat the left miss from toe strikes. The heel portion of the driver face has been twisted closed and delofted to help coax the ball back onto the target from heel strikes. 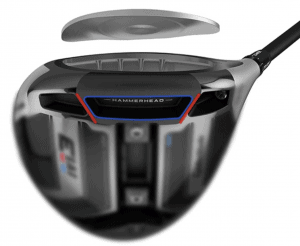 Basically, the new Hammerhead slot is designed to help create greater ball speed over a larger area of the face. The introduction of the slot allowed Taylormade engineers to place weight elsewhere in the clubhead. One 0f the benefits are decreased spin on shots hit lower in the face. Again, this is all done to make a larget sweet spot on the driver face. 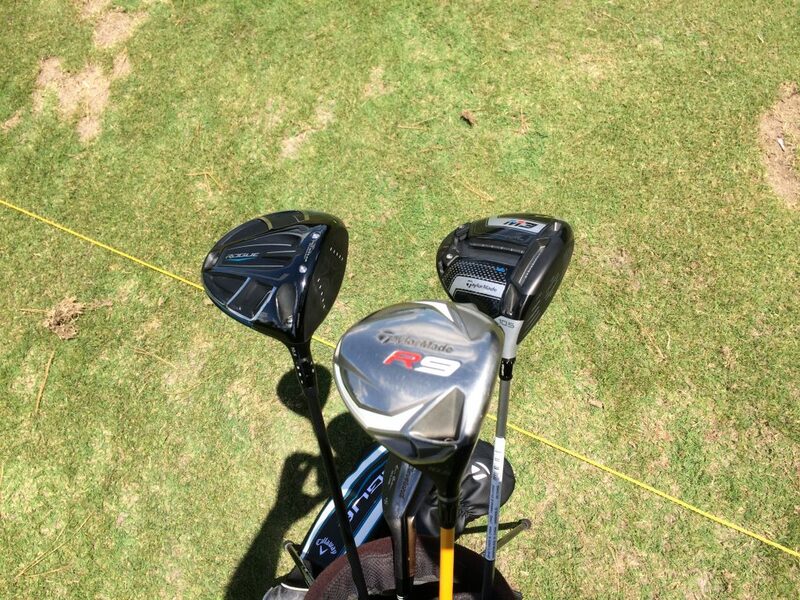 Thanks for taking the time to read my Taylormade M3 driver review. It’s a great club, and you just can’t go wrong with TaylorMade woods these days.